Boil 4 cups of water with 1 tsp salt and 2 tsp Sugar. When the water starts boiling, add the sliced french beans. Boil for 2-4 mins, till the beans become tender. It should not have a raw taste but at the same time, it should not be over cooked. Drain the beans and strain it one time with cold water. Leave it in the strainer to drain out all the water. In a bowl mix the mustard paste, pepper,salt, lemon juice, chopped garlic and olive oil. Add the mixture to the beans and mix well. Refrigerate for about halt an hour. Transfer the salad on a dish, drizzle 1 tbsp of olive oil and sprinkle the roasted sesame seeds on top of the salad. Serve. 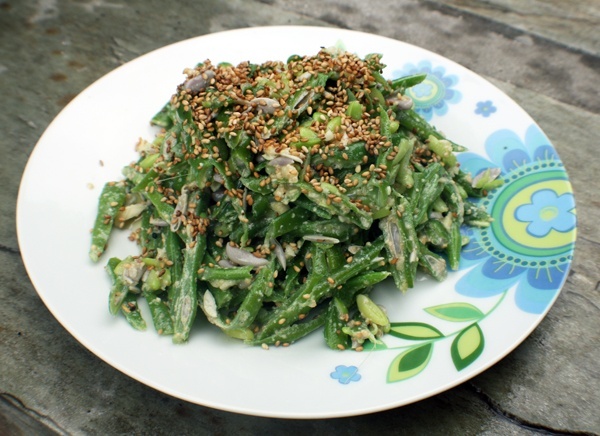 This entry was posted in Salads, Vegetables and tagged Green Bean Salad, Summer Salad by Kamakshi. Bookmark the permalink.